Sunday’s Set Points, French Open 2017 Day 1: Welcome back, Petra! On the very first point, Kvitova smacked a forehand winner away… welcome back, Petra! I really didn’t know what to expect from Petra’s level. I was just pleased that she was back playing tennis again. The serve, the forehand, the Pojd bark. It was all glorious. The performance though was really top notch and it did have a feeling that Petra had never been away. In a superb display, Kvitova won, 6-3 6-2 in just 73 minutes. The forehand was on song and some of her winners were 😍😍😍. There was one point in the first set where Kvitova stumbled for a moment before running out wide and unleashing a trademark forehand winner down-the-line. The serve was also a big success as Kvitova hit nine aces and dropped just 15 points behind her serve in nine service games. Petra’s reaction at the end was everything and such a heartwarming moment. I spotted her dad sobbing in the stands! And the reaction from WTA players was also lovely. Super sportsmanship too from Julia. I was a happy bunny as Petra was swiftly joined in the second round by Timea Bacsinszky. The Swiss player dropped just three games in a convincing win over Sara Sorribes Tormo, 6-1 6-2. Bacsinszky had a few wobbles with her ball toss and a couple of lengthy service games but on the whole, was in control with some patient, yet forceful tennis, coming forward to the net whenever the opportunity arose. Timea reached the quarter-finals of the French Open in 2015 and 2016, and I think she could go a long way again this year. Bacsinszky’s second round opponent will be Madison Brengle – the American outlasted Julia Goerges in the first extra-time finish of the tournament, 1-6 6-3 13-11 in a final set that lasted 100 minutes alone. The stats were wild! The first seed to fall at this year’s French Open was the number 31 seed, Roberta Vinci – in her best win by ranking for over three months, Monica Puig beat the Italian for the first ever time, 6-3 3-6 6-2. Puig was very emotional at the end and there was a lovely embrace between the pair. Puig played a really sound third set, using her serve to set up a pair of winners at a crucial stage of the match at *4-2 *30-30 in the decider. The highest seed to fall on day 1 of the 2017 French Open was the number one seed, Angelique Kerber. In all honesty, I think most had tagged her first round match against the world number 40, Ekaterina Makarova as a tough opener. Makarova dominated early proceedings but was forced to fight hard in the second set with four of the last five games going to deuce. Makarova eventually sealed the win, 6-2 6-2. Despite some late jitters from Makarova where she backed off towards the end, it was an all-round impressive display from Makarova who hit the ball with real conviction and dominated many rallies against a mostly passive, Kerber. I really feel for Angie right now and I refuse to join the bandwagon of hate and criticism that has surrounded her for much of the year. Things are going badly but that takes nothing away from her fantastic achievements of 2016. I was pleased to see some positive body language from Kerber in the second set against Makarova and she looked to be on the comeback; however, she threw in a horrible game at *2-4 and missed a lot of returns on break points. I think going out early here will actually be a blessing in disguise as it will give her three weeks to prepare for the grass and perhaps evaluate what is happening this year. Snippets from Kerber’s press conference are available in the article linked below by Reem Abulleil. A big surprise was caused by Cagla Buyukakcay who won just her third main draw match of 2017, beating the number 22 seed, Mirjana Lucic-Baroni, 6-3 6-3. A great win for Cagla! 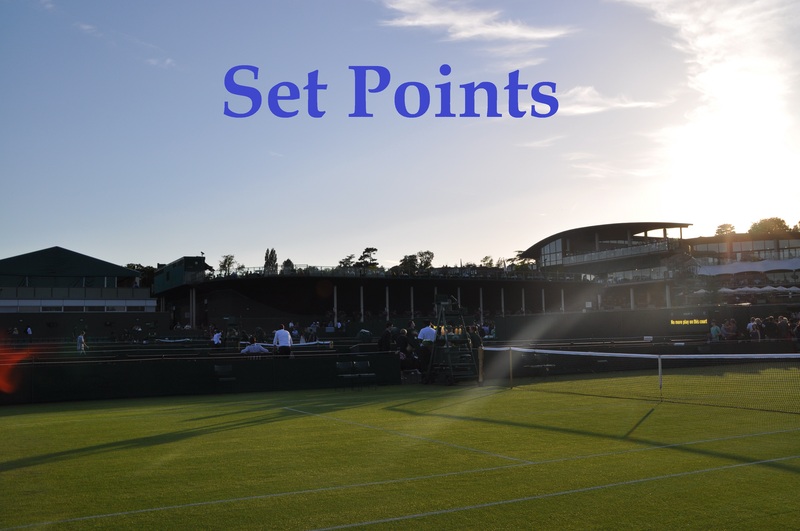 I watched the second set of Svetlana Kuznetsova’s straight set win over Christina McHale, 7-5 6-4… was I the only one who was CONVINCED this was going the distance?! McHale got stuck in and was brave at times, saving break points at *2-4 and eventually leveling up at 4-4 in the second set. Kuznetsova was beginning to wobble. Credit to the former champ who stayed in the moment and got some help from McHale in the end to convert on her third match point. Kuznetsova spoke in her press conference about dealing with nerves and not realising what the score was in the second set! I had this sudden sinking feeling before the match that Kuznetsova was a goner! She did well to wrap up in two but will likely face a stern challenge in the next round against huge hitter, Oceane Dodin. From a break down in both sets, Venus Williams secured a hard fought win over Wang Qiang, 6-4 7-6(3). There was some really good stuff from Venus against a quality opponent. In her 20th appearance at the French Open, Venus will play Kurumi Nara in the second round who came from a set and a break down to beat the 15-year-old, Amanda Anisimova. Clutch from Venus to win in straights. Wang Qiang one of the most improved players in 2017, tensed up a tad leading at the end of both sets. The day ended with wins for Dominika Cibulkova and Aliaksandra Sasnovich – the latter came from a set down to beat Viktorija Golubic, 4-6 7-5 6-3. Golubic collapsed to the ground on match point with what looked like cramps. It was nice to see Sasnovich go over and give Golubic some support. The Swiss player is having a rough year and has lost her last seven matches including three of those against Sasnovich. My favourite match on Monday’s schedule is a battle of the champs up first on Philippe Chatrier Court… who you got? May 28, 2017 in Roland Garros, Set Points, WTA. Yeah so happy for Petra! I ran my marathon today so have been on the emotional side anyway so not ashamed to say I welled up when I saw she won. And it’s really a shame for Kerber. The negativity around her is a little sexist IMO though since Murray is also bombing hard right now. I wouldn’t be surprised if she pulled it together at Wimbledon though. I’ve always considered that her best Slam and had Serena not been determined to win last year than Angie would have taken it. Congrats on the marathon! Same feelings with Petra and she played so well. Agree that from what i’ve seen, Murray has got off lightly compared to Kerber. I also really like grass for Angie so if she’s going to get it together anywhere, it will be on grass. Fully agree. Murray is equally bad right now but only receives half of the criticism. I was hoping she would get through but somehow I knew (as everybody) this wouldn’t happen. yes – it *can* come everything together in wimbledon but I’m not entirely convinced that her wobble has something to do with the surface. I think most of it is the pressure and I like the idea if she could get help from someone who has dealt with it in the past. Boris Becker hopes for S. Graf it seems but I would prefer someone who could also improve her game… someone as Navratilova for example (leftie & agressive serve and volley game). As for Petra I’m delighted. I hope she is able to deal with the demons that usually come with such a horrific attack (mentally wise). As for now it seems she is fine. Great congratulations on finishing the marathon! To me, marathon races are not about the winners, but about the average runners in the last 50% who giving everything they have just to finish the race. A very small percent of the population have the determination to train, participate, and finish a marathon race…. once again many congratulations. Thanks very much. I only signed up 8 weeks before running and trained nowhere near what is recommend but finished in the top 25%. Not bad for my first go! Oh and I could definitely picture Schiavonne pulling an upset! Great to see Petra back and with a win! It’s as if she never left the tour! I’m hoping Angie can pick up some form for the grass court season and I feel like this loss could be a blessing in disguise for her. If she does relinquish the number 1 ranking this fortnight, she plays much better without that added pressure of being number 1. The only difficult thing for the entire tour is once Vika, Maria and Petra hit top form, these tournaments won’t be easily won and as open. I was going to comment on the MLB vs. Buyukakcay match assuming The Moo would have missed it, but I forgot……..The Moo misses nothing!! Ha! just a mention as I didn’t watch that particular match. It’s heartening to hear the coverage Petra’s return to play and win have garnered in the media – she even got a mention on the 9 o’clock news on Radio 2 this morning. P.S. Andrew, well done on your marathon. I heard Petra got some news coverage which is great!